You’ve been disappointed about your career. You’re either frustrated about what seems to be a dead-end job, you haven’t been able to find anything in your chosen line of work, or even worse, you’re out of a job and haven’t been able to find anything for weeks, maybe months. The suggested approaches don’t seem to be working; you’d like to try something new, but you have no idea how to begin. You will find that new beginning in this book, and hopefully, you will also find the work you were born to do. My approach is definitely “something new,” an approach that is rarely provided to those seeking a new job or their work. There’s no doubt that when it comes to leadership in general and the job search in particular, I am a maverick. The current definition of the term focuses on independent individuals who refuse to go along with a group, party (political), or any commonly held ideas or concepts that they disagree with. In some circles, mavericks are known as “deniers”; the global warming controversy is a good example of this. 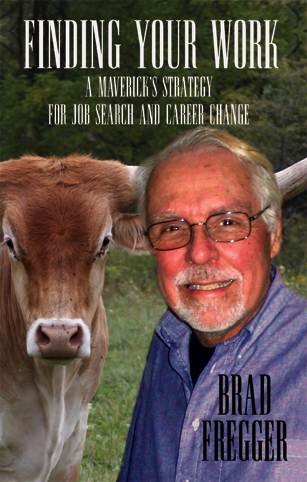 When it comes to ideas on the best methods for landing a job, or finding your work, I’m definitely a maverick and this book is, without a doubt, a maverick’s strategy for job search and career change. I’ve been frustrated with the advice that I am hearing from the “experts” on how to find a job. In my experience most of them don’t know what they are talking about. For example, this focus on resumes is ridiculous. Rarely does someone get hired because of their resume. In addition, management, especially HR management, is extremely leery of the resume process, knowing the amount of spin and outright lying that goes on when a resume is written. I didn’t trust resumes for the opposite reason: I was concerned that I would miss the right person for the job because their resume didn’t meet corporate requirements. In fact, some of the best people I hired had resumes that were dramatically lacking in academic achievement and job experience, the two main criteria for HR professionals. The resume is the main reason people don’t get the job; yet they continue to send it out, hoping against hope, that by some miracle they will get a call for an interview. There is a better answer, one that has consistently worked for me, and for those I have helped over the past 40 years. You will find some of their stories in this book. In fact, stories are at the heart of the process, as you will discover. So, I encourage you to read the stories I share with an open mind. I know that you, too, can have success in finding a job, in finding your work. Personal experience has shown that this is true, and thiis why I wrote this book. It’s time you find out the truth about job search and career change.